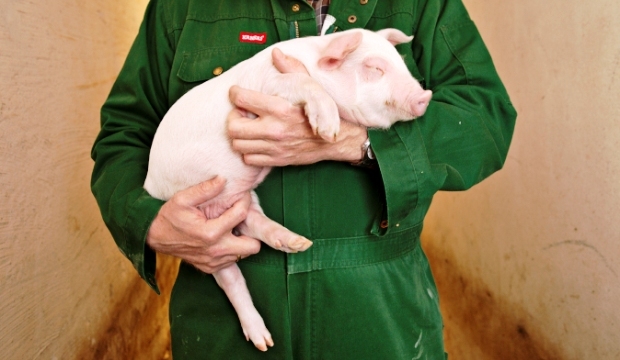 Danish authorities don’t check which pig farms are infected. Most pig farmers and people working on pig farms are not tested to check if they carry the dangerous bacteria. Visitors don’t know if a farm is infected. Direct contact with infected animals has the highest risk of transmitting the MRSA-infection to humans. Washing hands and changing clothes might not be enough to stop the transmission, warns experts. According to rules established by the Danish labor inspection, pig farmers must inform their employees if MRSA is demonstrated in their pig herds. Nobody knows to what extent this actually takes place, and there are no demands to inform previous employees if MRSA is demonstrated later on, says Hans Jørn Kolmos, professor of microbiology and chief physician at Odense University Hospital. – It is obvious that this very relaxed attitude contributes to an increased transmission and spread of MRSA from pig herds to people in the surrounding society. The farmers and their employees may not become ill themselves, but they can readily transmit MRSA to newborns and older fragile people, who run a higher risk of infection when exposed to the organism, Kolmos says. In 2012 21% of all MRSA CC398 cases reported to the Danish national board of health took place in persons who had no farm contact. In local areas with many pig farms this figure may be as high as 40%, indicating that the organism is now being transmitted in society, probably by person-to-person contact. – Farmers and their employees probably play a key role in transmission to people who have no farm contact themselves. Other potential routes of transmission are by airborne emissions from ventilation chimneys of pig production plants, contact with manure, or by retail meat, stresses Kolmos. The national board of health has issued recommendations to control transmission of MRSA CC398 by employees from herds to the surrounding society, focusing on hand hygiene, shower facilities and change of clothing. – Nobody knows to what extent these recommendations have been implemented. The spread in local areas clearly illustrates that the national recommendations are insufficient to control the epidemic, Hans Jørn Kolmos warns. The chairman of the Danish Association of doctors, Mads Koch Hansen, and the chairman of the Danish Association of veterinary doctors, Carsten Jensen, ask in common statement in the Danish paper Politiken, 30 May 2014, for a political decision to do much more to stop the spread of MRSA. Their main arguments are the four deaths that have occurred and the spread of the bacteria from pig farms to the rest of the society. – The eradication of MRSA requires the enforcement of clear concrete rules, they write.